Hello! This thread is to keep track of the progress with my shortie bus conversion. I am a 19 year old college student based in Seattle, working to convert my 6-window Blue Bird 3800 International bus into a versatile RV capable of taking on road trips and camping, as well as serving as a potential living space for me during one or two of my next several years of college. My bus is named Ahote (uh-hoat), which is from the Native American language Hopi, and means Restless One. My name is Matthew, and the assets I bring to this build are my spacial reasoning, creativity, mathematical skills, and passion. I have little experience with electricity, plumbing, engines, and carpentry; however, I look forward to learning a decent amount about all of them as I go! I'm hoping to have all the base work completed by June so that I can bring Ahote up with me to Orcas Island for the summer, where I'll be able to take it out to camp once a week or more. So far I have been able to remove all the bus seats, and a decent amount of the flooring. The plywood beneath is in good condition everywhere but near the driver's seat, so I will be working to remove that seat (and the cockpit), so that I can rip out the rotten wood and repair the leak (which seems to be coming from behind the cockpit). I plan to leave the rest of the plywood as-is unless my father is a lot better at ripping it up than I am. So far I haven't even gotten it to budge. If there's rust under part of the floor, it will be just about everywhere. It would behoove you to remove the whole plywood layer and treat the metal floor. Removing it can be a PITA, but it is an essential step. 6 window is a great size! 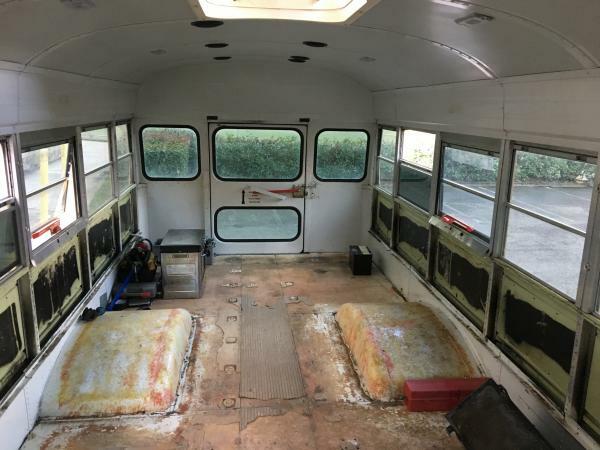 With the help of my dad, four crowbars, and two hammers, I was able to remove the walls from the entire bus, as well as the insulation. Most of the insulation was clean, dry, and undamaged, with the exception of one damp piece of insulation. We peeled up most of the rubber flooring today, the rest will likely come up with the plywood once I get the driver's seat out of the floor. Speaking of the floor, if anyone has advice about getting particularly tricky plywood up, please let me know. This stuff is nailed into the metal floor, and also seems to be stuck down by thick black rubbery glue. I'm having a hard time even getting a crowbar in between the wood and the metal! I took a circular saw set at the depth of the plywood and ran a cut about an 1/8" away from the row of screws. Then long pry bar and grinder for the difficult ones. Lots of screws had to be ground down after the plywood was up. I got a DT466E engine on an International 3800 chassis! Currently I'm working on the ceilings, I should be able to get them all out using a hammer, chisel, and crow bar. My dad will be back with his power tools once all this snow melts, but for now I'm going solo. In the meantime, I have a pretty urgent question. There are two wires coming up out of the floor behind the driver's seat, a negative and a positive. They seem to be coming straight from the batteries beneath, and they're live. The bus came as-is, so I have no idea what they used to be wired to, or why they're there. I'd like to remove them, any tips for how I can do that? Follow them to the battery and disconnect them. Great engine. It will have plenty of power for a shorty. If you look on the top of the valve cover there should be a sticker showing the power rating. Could be anywhere from 175-215 hp. How much have you driven it? If it's speed limited you can get it removed at an International dealer or any place with the right software. Doesn't your International have screws securing the ceiling panels, piece of cake removing the panels. I wish! It's rivets through and through. Wall paneling is all off and after a couple hours out there today I have three rows of rivets left. Two hours tomorrow should finish it up nice.